We went to Chartres, located about 90 km from Paris, like many others to see the impressive cathedral. 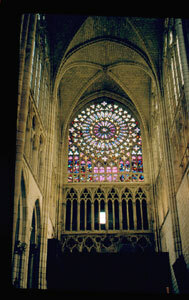 The stained glass windows are impressive, with the majority being original glass. The exterior of the cathedral along the sides is all classic flying buttresses, the front has two spires and an impressive rose window. The church holds a noted relic, the Sancta Camisa, which is said to be the tunic worn by Mary at the birth of Christ. With that, this has been a location for pilgrimages for some time. Inside I remember the stoned carved choir screen, it was very impressive. 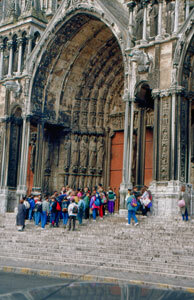 Chartres was one of the first locations we visited outside of Paris on one of the first trips. We just drove right up to the cathedral - it was simpler in those days - and did not stay very long in the town. If we return, the upper town has old houses that date from the 15th, 16th and 17th Centuries. On our second trip to France we went to Fontainebleau, located 65 km from Paris, to see the famous chateau. In those days the Hachette Guide was the book and this chateau was worth the three star rating. Napoleon added the horseshoe staircase,. This is known as la cour des adieux, the farewll courtyard, as it was from here that he bid farewell to him men when he abdicated in 1814. Although Françoise I had it built originally as a hunting lodge, his successors turned the chateau into a grand residence with a gallery, apartments for three queen mothers and of course a ballroom. Fontainbebleu created a decorative style of its own, known as the school of Fontainebleau. We drove through the Fontainebleau Forest.Not sure what I was expecting, but it has been there since the Middle Ages! I was impressed with the thickness of the walls which is very evidehnt by the windows. .
With Karen being an artist, this town was on the list of places to visit. Located about 77 km from Parism this was a favourite location for the Impressionist painters. I remember as we turned, and then drove over the small birdge with the mill beside the river, I was quite impressed. We parked the car and had a short walk about the town. There are 15th & 16th Century houses and the church dates from the 12th t0 13th Century. The Loing was the favourite river of artist Sisley. It was at Provins that we experiences our first true festival. The towns people were dressed in medieval costumes, there was food, games and the town was just abuz when we arrived. 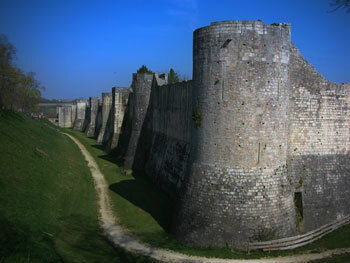 The ramparts around the Medieval town of Provins located about 90 km from Paris. 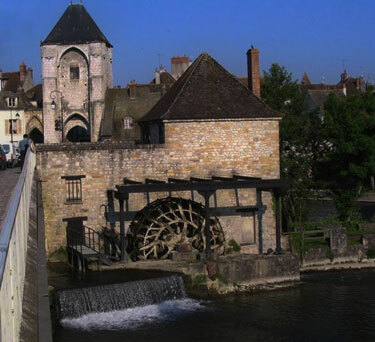 This is a very well perserved Medival town and at one time it was the third largest city in France. There are a number of buildings and houses that are open for tours, but the Sunday that we were there, it was all closed for the festival. And it was great. We arrived and the abbey, which was founded by Saint Louis when he was 12, was closed. I looked through the locked gate knowing we will have to return. The abbey church dates from the 13th Century. There are impressive Gothic cloisters. Considering it is 44 km from Paris, we will turn to work it in on one of our upcoming trips. 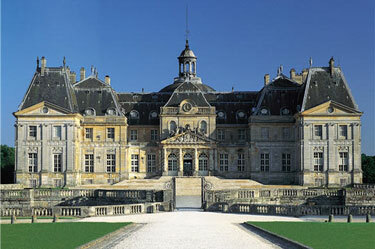 This impressive chateau was built by the Minister of Finance Nicolas Fouquet under Louis XIV. The King was so impressed, he hired the same architects to build Versailles, which of course, has to be on a more grand scale. But never upstage your boss. The King has Fouquet send to Brittany and then later condemed him to life in prisson. 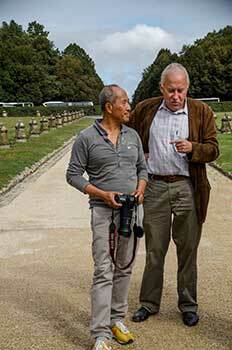 On our first vist, we arrived at Vaux-le-Vicomte on our way out of Paris. We opted to take a regular road, and it took for ever, but we did have a tour of the chateau and enjoyed it. The gardens are pleasant. In 2012 we returned with friends from Paris, Vannarith & Jacques, to spend the better part of the day here. 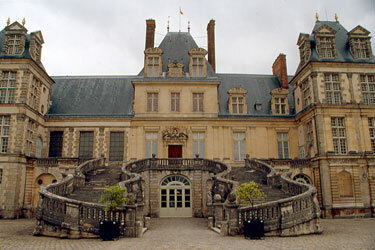 Rent an audio guide, the history of this château is very interesting. The nabbing of the owner by the jealous King and his banishment is riveting. Versailles is located about 20 km from Paris, a short train ride, it makes a great day trip when visiting Paris. Allow yourself ample time and there is lots to see and massive gardens to wallk and enjoy. 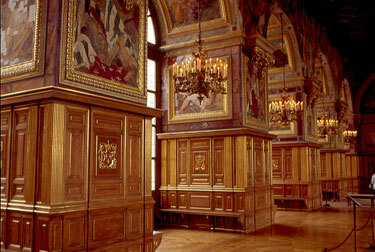 This was the centre of all power in France when King Louis XIV moved from Paris to Versailles. It remained so until by the French Revolution the Royal family was forced to leave. Sometimes we have not been big on taking guided tours, enjoying to walk by ourselves and enjoy. But here I would recommend you join the lines, purchase your tickets and taken a tour of the Grands Appartements. You will have exposure to the private world of the court and the maze of hallways in behind the rooms that join the main rooms of the apartments. We found it very interesting and you not gain an appreciation for this on your own. This site is interesting in providing information on the chateau.